Preview tracks and a full press kit, including photos, films, and podcasts with community conversations, are available here: http://bit.ly/MaxvilleToVanport. "The album confronts head-on issues such as prejudice and migration. The content isn't, however, weighed down by despair; instead, it's buoyed by...hope." "Ezra Weiss showcases his musical intelligence, diversity and status as a bold, inspired figure in the contemporary jazz arranging scene." (PORTLAND, OR)—Portland Jazz Composers Ensemble (PJCE) presents encore performances of From Maxville to Vanport, original songs and short films inspired by Oregon’s blue-collar Black history on Thursday, February 28th at 7:30 pm at Oregon State University and on Sunday, March 3rd at 8 pm at Portland’s Mission Theater. These performances also feature a ten-minute documentary film “The Making of From Maxville to Vanport” by Sika Stanton. The documentary shows how the project was created from community discussions that inspired the music to the world premiere concerts. The film, shown at the Mission Theater at 7 pm on March 3rd, will be followed by a conversation with project collaborators, facilitated by Vanport Mosaic. There will be a 30-minute break before the music begins at 8 pm. From Maxville to Vanport celebrates the history of two Oregon towns that reveal distinctive viewpoints of the state’s under-represented Black history. Drawing from jazz, R&B, and blues, From Maxville to Vanport tells the stories of Black workers and their families in rural eastern Oregon and just north of Portland. The music, brilliantly composed by Ezra Weiss with lyrics by poet S. Renee Mitchell, honors their resilience, humor, and contributions to Oregon while also looking honestly at the prejudice and hardships they faced. From Maxville to Vanport will be performed by the PJCE, joined by vocalist Marilyn Keller. The performance includes two film shorts by Kalimah Abioto, also scored by Ezra Weiss. PJCE’s Executive Director, Douglas Detrick, was the artistic director for the project, which was funded in part by an Oregon Community Foundation Creative Heights grant. From Maxville to Vanport premiered in April 2018 in Eastern Oregon and in May 2018 at the Vanport Mosaic Festival. PJCE released an album of the recorded music in November 2018. Tickets $25 GA, $20 senior, $10 students, $5 Arts for All. Among the homesteaders, loggers, and ranchers who were Oregon’s early settlers, Black Americans played vital roles despite being legally barred from living in Oregon by the state’s constitution. From Maxville to Vanport connects two blue-collar, multicultural communities that existed decades apart, but tell an important story about the Great Migration in the Pacific Northwest. PJCE is committed to creating an artistic and cultural context where Oregon’s jazz community can participate in society’s most pressing conversations. PJCE’s Executive Director Douglas Detrick, an Oregon-raised history buff, first learned about Maxville from a Wallowa County resident and immediately saw a connection to Vanport. Both towns were short-lived communities built to house multicultural workforces. The stories of these towns can help us understand why Oregon looks the way it does now. The project invites the audience to consider what Oregon represents. Was it worth leaving one’s home to find work here? Was freedom available to Black Oregonians in 1923? In 1948? In 2018? From Maxville to Vanport suggests that “Oregon Sounds Like Freedom,” as the first track on the album says, and that many hard-working people decided the reward was worth the risk. Maxville was a logging town, created in 1923 and shut down ten years later, in Wallowa County in northeast Oregon. Vanport, built for shipyard workers in 1942 just north of Portland, was destroyed in a matter of hours by the flooding Columbia River in 1948. Both towns were multicultural communities that housed workers with significant African American and immigrant populations at a time when many Oregonians were openly hostile to them. From the beginning of World War I through the 1960s, millions of African Americans left their homes in the South in a mass exodus called the Great Migration. They left to escape the systematic oppression of segregation, Jim Crow laws, and the threat of lynching. Jazz was a product of the Great Migration, too. In 1922, twenty-one-year-old Louis Armstrong moved from New Orleans to Chicago, where he made his first recordings and became one of the world’s best-known musicians, achievements he may not have attained had he stayed in New Orleans. From Maxville to Vanport is a collection of contemplations and commemorations created in a year-long composition process. PJCE began that process in the fall of 2017 with community discussion events in Portland and Joseph, a town in Wallowa County near the historic Maxville townsite. Feedback from descendants of Maxville loggers and Vanport flood survivors, along with extensive conversations with Maxville Heritage Interpretive Center Executive Director Gwendolyn Trice, whose father worked as a logger at Maxville, helped shape the composition. The project was funded by the Oregon Community Foundation’s Creative Heights program and was sponsored by the Oregon Historical Society. Project partners include Vanport Mosaic, the Josephy Center for the Arts, the Crossroads Carnegie Center for the Arts, Eastern Oregon University, and the OK Theatre. Marilyn Keller is a singer who performs jazz, gospel, and musical theatre throughout Oregon and abroad. She joined Black Swan Classic Jazz Band in 1997 and is active in a variety of ensembles and styles, including the Don Latarski Group, Darrell Grant’s The Territory, Thara Memory, Tall Jazz, Disciples in Song, and the Augustana Jazz Quartet. She was voted into the Oregon Jazz Society’s Hall of Fame 2016. Ezra Weiss has recorded seven albums as a bandleader, most recently “Before You Know It,” recorded live in Portland, and has written three musicals for Northwest Children’s Theater. He has led his own bands at major venues throughout the US, including several weeklong engagements at Jazz at Lincoln Center’s Dizzy’s Club. A three-time winner of the ASCAP Young Jazz Composer Award, he was listed in 2012 and 2013 DownBeat Critics Polls as a Rising Star Arranger. He teaches at Portland State University and holds a Bachelors in Jazz Composition from the Oberlin Conservatory and a Masters in Jazz Piano from Queens College. S. Renee Mitchell is an award-winning writer, multimedia artist, social justice advocate, and educator. A community-grounded visionary, she has had more than 25 years of journalism experience and is an expert at grant-writing. She won the Yolanda D. King Drum Major Award in 2015 in recognition of dedicated community service. She was the librettist of “Sherman: A Jazz Opera” and has published a novel, a children’s story, and several small-press zines. She also teaches writing to children as a leader of the Saturday Academy Social Justice Camp. A native of Memphis, Tennessee, Kalimah Abioto creates films centered on dreams, sexuality, and the nexus between humans, freedom, and the natural-spirit worlds. She received her BA in Film and Video from Hollins University and is a co-creator, along with her four sisters, of The People Could Fly, a multimedia project that documents the dreams and stories of people in the African Diaspora. Abioto has worked with Afropop Worldwide, Holy Mojo, The Black Portlanders, Spirit Law Center, and Diamond Law. Gwendolyn Trice founded Maxville Heritage Interpretive Center, a nonprofit cultural heritage center in Wallowa County, Oregon, and currently serves as its Executive Director. She provided support and information for Oregon Public Broadcasting’s 2009 film, Logger’s Daughter. Currently, she is on the Oregon Commission on Black Affairs and is part of a leadership cohort for the Center for Diversity and Environment. Sika Stanton is an award-winning photographer and digital content producer based in Portland. Portland Jazz Composers’ Ensemble is a 12-piece jazz ensemble that commissions and performs original works by its members and other jazz composers in Portland and beyond. 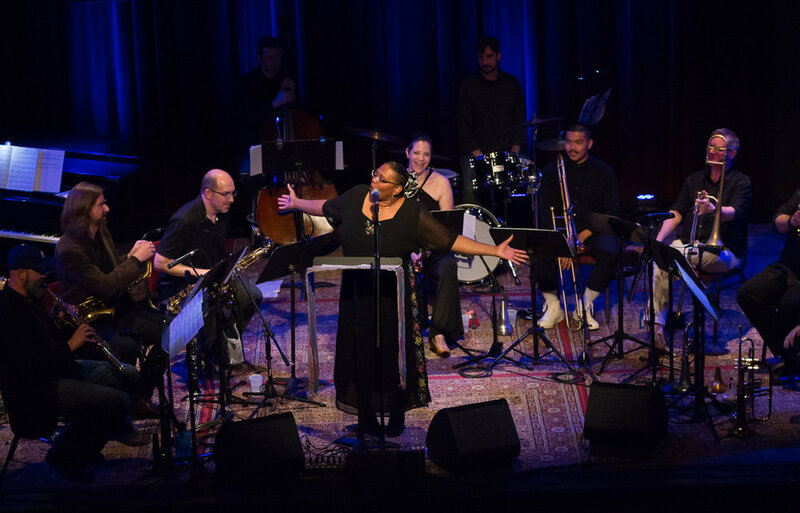 It is PJCE’s mission to act as a forum for the development and presentation of works for large ensemble by established and emerging jazz composers and to engage and enrich community awareness and appreciation of contemporary music. From Maxville to Vanport features Lee Elderton – soprano sax, clarinet; John Savage – alto sax, flute; Donnie Norton – tenor sax, clarinet; Mieke Bruggeman – bari sax, bass clarinet; Douglas Detrick and Farnell Newton – trumpet, flugelhorn; John Moak and Matt Hetwer – trombone; Ryan Meagher – guitar; Jasnam Daya Singh – piano; Bill Athens – bass; and Ken Ollis – drums.